Keep wood out of the ground with precast concrete Perma-Columns. As the first product to combine the economy of post frame construction with the durability of a concrete foundation. We use the latest in SCC precasting technology. Microfibers add shock resistance and durability. Microsilicia enhances flexural/compressive strength and erosion resistance. A corrosion inhibitor protects the rebar reinforcement from rusting, and a final admixture is added to give freeze and thaw protection. Our special mix guarantees a lifetime of durability. The wood column is attached to a “U” shaped steel bracket. The bracket is robotically welded to steel reinforcement that runs the entire length of the column. All the steel we use is premium high strength alloy purchased in the U.S.A.
Perma-Columns are three times the strength of standard concrete and in comparative strength tests conducted by Wisconsin and Purdue University, Perma-Columns have proven to outperform the industry standard wood columns. Perma-Column's innovative uplift anchor eliminates the need for an added concrete mix in the backfill. Streamline the building process with one-step placement and leveling. 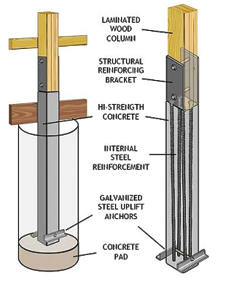 This technique requires the Perma-Columns (precast lower sections) to be attached to the wood columns ahead of time in a controlled shop environment, and then shipped to the job site with trusses, steel panels and other building components. At the job site, the assembly can be handled the same as a standard wood column, typically set in place with a skid loader. Requires the Perma-Columns to be shipped to the job site unattached, and then set without the upper wood section. Later, wood columns can be attached one at a time or tilted up as an entire wall. This allows for a concrete floor to be poured ahead of framing, and allows many jobs to be started while weather permits and finished during winter. Perma-Columns require the splash board to be attached using a pre-drilled concrete nail. To do this, drill a 3/16” hole through the splash board into the concrete post 1-1/4” deep using a hammer drill. Angle the drill toward the center of the concrete post to avoid hitting the interior rebar. Drive a 2-1/2” x 3/16” galvanized steel split drive anchor (HW28) into the post until the skirt is secure. WARNING: Avoid using concrete screws & concrete nail guns because most are not designed for high strength concrete and result in screws being stripped, heads twisting off or surface chipping.